To fully appreciate blaxploitation, one must understand the times from which the phenomenon was born. Sweet Sweetback's Baadasssss Song is the infamous film that started it all, and revolutionized the movie industry in that it depicted a black man who lived throughout the entire film. Just the simple fact that a black man was used for something more than mere cannon fodder, or played as a token, was such a groundbreaking idea that it turned the world up-side-down. The film was marked as obligatory viewing for all black panthers, and spring-boarded the whole genre. It is because of that film that we now have stars like Samuel L. Jackson, Dave Chapelle, Morgan Freeman, etc. Sure, there were fine black actors, like Sidney Poitier, who played marvelous roles before that too, but always as "the black person." Never the hero. And that is what blaxploitation did: It made black beautiful and gave colored people a reason to be proud. Suddenly it was cool to be colored, and white people started to imitate their black brothers, giving us John Travolta, Nicolas Cage, and all the rest. But making the first film that showed a black man staying alive wasn't easy. 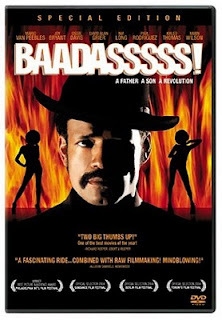 Melvin van Peebles had to fight every second during filming, and as a bitter irony, it was nearly the death of the director himself. Baadasssss! is the story behind the story. Directed by Melvin's son, Mario van Peebles, it gives a rare rare insight into one of history's most important, yet overlooked films.